The following books must be purchased directly from the publishers or local bookstores. The NCGIA does not distribute these publications. Michael F. Goodchild and Sucharita Gopal, eds. London: Taylor & Francis, 1989. Max J. Egenhofer and John R. Herring, eds. Portland, ME, USA, August 1995. Lecture Notes in Computer Science, Vol. 951. J. Brotchie, M. Batty, E. Blakely, P. Hall, and P. Newton, eds. London and Melbourne: Longman-Cheshire, 1994. Cities of the 21st Century: New Technologies and Spatial Systems. J. Brotchie, M. Batty, P. Hall, and P. Newton, eds. New York: Halsted Press and London: Longman Cheshire, 1991. Cognitive and Linguistic Aspects of Geographic Space. D.M. Mark and A.U. Frank, eds. Timothy L. Nyerges, David M. Mark, Robert Laurini, and Max J. Egenhofer, eds. NATO ASI Series. Series D: Behavioral and Social Sciences, Vol. 83. Design and Implementation of Large Spatial Databases. A. Buchmann, O. Gunther, T.R. Smith, and Y.F. Wang, eds. First Symposium SSD '89, Santa Barbara, CA, Jul. '89, Proceedings. Diffusion and Use of Geographic Information Technologies. Ian Masser and Harlan J. Onsrud, eds. Dordrecht, Boston, London: Kluwer Academic Publishers, 1994. Michael F. Goodchild, Bradley O. Parks, and Louis T. Steyaert, eds. held in Boulder in 1991. Fractal Cities: The Geometry of Form and Function. Paul Longley and Michael Batty. 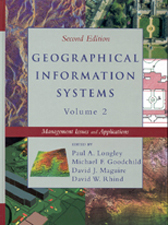 Geographic Information Systems: An Introduction. Jeffrey Star and John Estes. Englewood Cliffs: Prentice Hall, 1990. Paul A. Longley, Michael F. Goodchild, David J. Maguire, and David W. Rhind, eds. New York: John Wiley & Sons, Inc., 1999. With Applications to Planning and Business. David A. Plane and Peter A. Rogerson. New York: John Wiley & Sons, 1994. 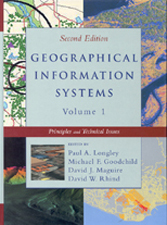 Geographical Information Systems: Principles and Applications. D.J. Maguire, M.F. Goodchild, and D.W. Rhind, eds. Carol A. Johnston, David R. Maidment, and Sandi Glendinning. Ft. Collins, Co: GIS World, Inc., 1995. 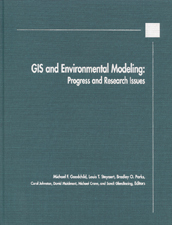 The Integration of Remote Sensing and Geographic Information Systems. Michael Goodchild, Max Egenhofer, Robin Fegeas and Cliff Kottman, eds. Boston, Dordrecht, London: Kluwer Academic Publishers, 1999. Interpreting Space: GIS and Archeaology. Kathleen M.S. Allen, Stanton W. Green, and Ezra B.W. Zubrow, eds. London, New York, Philadelphia: Taylor & Francis, 1990. N. Obermeyer and J. Pinto. New York: Guilford Publications, 1994. Map Generalization: Making Rules for Knowledge Representation. B.P. Buttenfield and R.B. McMaster, eds. Harlan J. Onsrud and Gerard Rushton, eds. Center for Urban Policy Research, 1995. Stewart Fotheringham and Peter Rogerson,eds. London: Taylor & Francis, 1994. London: Taylor and Francis, 1995. Max J. Egenhofer and Reginald G. Golledge, eds. graphic information systems (GIS). London: Oxford University Press, 1998. Spatial Information Theory: A Theoretical Basis for GIS. Andrew U. Frank and Irene Campari, eds. Elba Island, Italy, September 1993, Proceedings. Theories and Methods of Spatio-Temporal Reasoning in Geographic Space. A.U. Frank, I. Campari, U. Formentini, eds. Spatio Temporal Reasoning. Pisa, Italy, Sept. 1992, Proceedings. Berlin, New York: Springer-Verlag, 1992.